Club Penguin Cheats by Mimo777 Club Penguin Cheats by Mimo777: New Club Penguin Sleds Are Now Available! Check it! New Plastic Sleds at the Club Penguin Ski Hill! 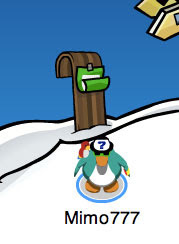 Go to the Ski Hill and click on the Sled. I wonder if they go faster! Go buy one and let me know! I'll get em in a bit! Wow that was fast Mimo! And thanks for posting my name! I think Club Penguin should make Skis. I think there slower than the sleds! They just clunkyer(if thats a word) and wobble about more. The tobbugan is much faster and these just look nicer. hey Mimo the sleds were supose to be out tomorrow but they are here today!Why didn't they post the snow maze and the snow and sports catalog! Hey i just bought one and they are AWSOME they look so cool in the game! no they don't go faster but there pretty cool to use! Feathergreen here again. YES! They do go faster! Try sledding with one on an ice patch on Penguin Run! You go flying!! The dojo is back to normal now! hey mimo u forgot about the other furniture catolog cheats 1. click one of the legs from the coffe table and get the wooden stove. 2.click the seat of the chair and get a coat rack. page 2 1. click the top of the fortress and get the icicles. ok bye hope u post them in ur blog bye! The Snow Maze game will be available on the 27th-29th. And I'm pretty The Snow and Sports catalog will come too because usually stuff comes out Friday! He already put about the catolog cheats, but he did them the wrong way round if you look!! Lol! mimo the done said that it was supposed to dome out tommrow! 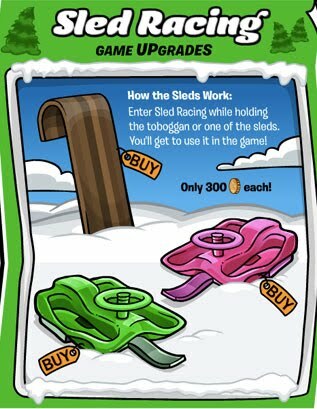 They posted the sleds early because they didn't want to put to many new things on to club penguin at once i think. There is a new newspaper today though so there is probraly another reason. Trying to get the full outfit is hard!! These things are awesome! its a shame you cant go faster though.... but on the bright side tomorrow will be a good day! It just feels like it will be! I guess there is another side of the story. Some nonmembers resent members. I mean EVERYONE wants to be a member. but not everyone can pay 5 bucks a month. Its kind of sad how cp takes advantage of "rich ppl." They could raise the prices and 90% of members would still pay. Can I ask u AMericans something? In ENgland theres an awesome programme called I'm a celebrity Get Me out of here! Does it appear on American TV? The New Sleds don't go faster. But they are much cooler than the normal sled!!! They are the same but look different! They're huge! I can't tell if I'm about to crash into a rock or not! Yes they do, but if you want to go faster you can buy a tobbugan is the fastest so far. they go a little faster but on the uder cover mom topic u must be a member to buy one wich is very unfair! Thanks Mimo! You helped solve a mystery! i wish non members could do th maze... oh, and heres a cheat! one day , my mum checked her emails and found a weirdemail from club penguin sayin, 'your 6 month membership has been activateed!!' no one in my family has a credit card, so i cant buy a membership. none of my friends had bought me it. so i said, 'oh well,' and started living like a member! for 2 days i spent my 7000 coins i had collected over the years, but then my said that she didnt like the idea of some random paying for a membership for me. so she cancelled it. i was REAL bummed at first, but i got over it and now i dont blame her!! well happy christmas and new year! !